One for Teragram: Real Live Preacher casts a vision for communion. Pretty big gulf between it and the newsprint-consuming shenanigans in Drogheda. Your Correspondent, Once he held the moon. P4290011, originally uploaded by Zoomtard. Well it all turns out for gain. After last Friday’s debacle, this Friday brought a not-so-surprise delivery from An Post. 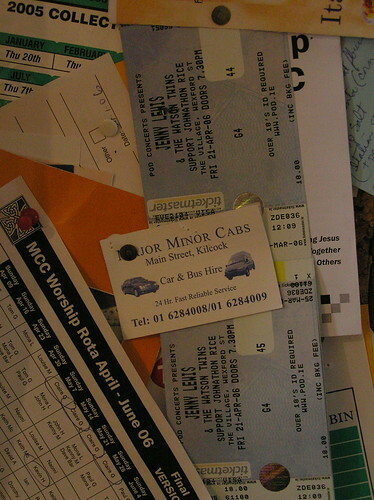 The open envelope bearing my week old Jenny Lewis tickets arrived through the letter box. Sure I missed the gig of the year, but now we know An Post will post anything. Twice. Jimlad is the newest furious thinker. Welcome him with applause and garlands, sexual favours and golden handshakes. No golden showers though. The last new furious thinker, Yellow Snow, did not appreciate that one little bit. Teragram will learn for the future. Anyway, Jimlad amazed us with his piece of crap blogspot efforts so much that we let him into the cool gang. We’ll transfer all his old entries over sometime in the next month but don’t expect it anytime rapid like, on account of momentous happenings in Jimlad’s life. Today he follows me and many other trendsetters by marrying a woman. He knows her so that helps. It should be a great day for most everyone involved, except maybe the person who has to sit beside me after my 2nd West Coast Cooler. I subscribe to a great magazine called The Atlantic Monthly and every time a new edition pops through the letterbox with the various errata I stuffed into post boxes the previous week, I look forward to the reviews by a writer called Caitlin Flanagan. Maybe she is a little bit scattered in her attacks (who am I to judge that? ), but damn she has a way with words. Imagine Kevin Myers but with unbelievable cheekbones and having a go at feminists who think wealth leads to liberation instead of having a go at Republicans who think that violence leads to liberation. As a Christian with slightly odd views about many things I know what its like to stick your head above the parapet to say, “Lads, I don’t think you are on solid ground there”. But far worse than being a Christian amidst fundamentalists is to be a feminist amidst fundamentalists. Flanagan has been having a hard time this week because she has published a book that looks into the hazy, misty, never-really-existed past and proposed that traditional marriage formulations can offer a lot more than the “You go girl!” pastiche feminism we have to endure. The point of all this is that Flanagan is now a writer with the New Yorker so you can read her for free and you can also see the hilarious interview she did with the genius Stephen Colbert here. Can I just ask you all to pause a moment and consider how thematically coherent this Zoomtard has been? Marriage, feminist who gets attacked for her views on marriage and now Zoomtard talking about Christian feminism. Maybe I could do this seriously sometime…. In reality, Jesus was an extraordinary feminist, a literal nightmare for powerful interests to the point that they had to kill him and better recorded by a huge distance than any figure in classical history. But today I just want to touch on the feminist thing. It matters to me. Like all male feminists, I imagine, my feminism stems from viewing my mother. She worked full time and by all accounts, exceptionally well, as a primary school teacher for decades while co-raising six kids, maintaining a still blossoming marriage and nurturing all kinds of wider family connections that involved real sacrificial love. You couldn’t enjoy the company of my mom and ever think the Bible was wrong when it says, “Men and women, He created them equal”. And yet there are many churches today that insist that women should not be in leadership. Even if a woman is gifted, called and accepted for leadership by God the Father, by the Holy Spirit and by the local congregation in turn, even then they should sit down and shut up. Grr I say. Then I punch them. It is at about that point that Jimlad’s wife (well, she will be in 4 hours) steps in and calms everything down. But I have a lot of friends in Christianityland who have vaginas and who have the skills to pay the bills leadership-wise. My colleague in deepest darkest Norn Iron and I are nerding up on the area of “Biblical Equality” or “Complementarity without hierarchy” or “Female leadership” or just as I prefer to say, “Chicks rule”. And what I am finding is appalling. Two things. I won’t keep you long making my point. In the Judaism that Jesus (who was a Jew, you guys keep forgetting that!) grew up in we read things like if a woman speaks with a man in public she should be divorced without having her dowry paid back (Mishnah Ketubbot 1:8, 7:6). We get a hint of this in John’s Gospel when Jesus has a chat with the Samaritan (read: Racially inferior) woman at the well. While the Apostles have gone to get some lunch, Jesus has an amazing interaction with this woman and she is the first person he reveals his divinity to. Anyway, when the Apostles get back they’re all like, “Hey hey hey! Get away from him woman. Jesus! Don’t you know you shouldn’t be talking to her? Come over here and eat with us.” Maybe those weren’t the exact words but Jesus was radically against the prevailing winds of his culture as he conversed with women, treated them as equals, was happy to be close to them, was happy to have them as followers, asked them to learn from him and accepted their financial help. His first Resurrection witnesses are women. The only person he takes commands from is a woman. Jesus thought women were equal. That is blatant fact number one that I feel like getting off my chest. But fact number two is astonishing. It is terrifying. It is shocking. It is a real scandal in the place of the fake Da Vinci Code kind. Sadly, it isn’t nearly as entertaining as the Da Vinci Code and it has no role for Audrey Tautou. In Romans 16:7 we read that there is a person called Junias and he along with Andronicus is highly esteemed among the Apostles. They are in fact, outstanding Apostles. That is, these are people who have seen the Resurrected Jesus (there were about 500 of them) and they have now gone on to do marvellous things. You read this and you think that these folk must have been pretty obvious leaders of the church. Here is the shock. Between the 1940s and the 1970s, the name in the text “Iounian” has been translated as Junias. The masculine Junias has never occurred in any writing, archeology, architecture or cultural artefact of any kind in the whole New Testament period. Except here in Romans of course. Furthermore, older translations of the Bible, (KJV, Geneva, Tyndale, Wycliffe and Weymouth) all translate it as Junia. Junia is a girl’s name. Junia is one of the most common names of the era, especially frequent around Rome. Even the accenting on the letters in the original manuscripts rule out the masculinisation of the name. The fact of the matter is that Paul, in a letter to be read by a whole congregation communally, takes special care to thank a woman called Julia and awards her the title of outstanding among the Apostles. And Evangelical Christians who put together the NIV and other commonly used Bibles and who claim that they take Scripture as the supreme authority in all matters of faith, have skewered the meaning of the name to support their societal prejudices against women. Astounding! Of course there are obvious implications for the robust historicity of the text if manipulations and alterations can be so easily detected but I’ll leave you to stew on that one while sitting in the cinema watching Tom Hanks stare meaningfully at the Rosetta Stone. Your Correspondent, Diminishing femininity by making all his daughters wear fake beards. As you may have heard, Zoomtard has been appointed to a hot new job this week. As of some as yet undecided date in August, I will be leaving my beloved colleagues in the little cutting edge charity I have grown to love and am selling out to the man. Suffice to say that this video pretty much sums up what I’m going to spend my most profitable years doing. More about that some other day, maybe. But because of the appointment, this week has been one with effusive praise for your correspondent. He has been called “tremendous” by one person and “brilliant” by another and everyone has shook his hand enthusiastically saying “We’re very glad you’re joining us”. Some of your fellow readers have made bold promises to take him out to lunch in a real restaurant and at one point, the smartest person he ever met called him “gifted”. The ego is throwing up because it can’t contain anymore. All that was brought into focus last night. If you don’t live in Dublin, you really missed out yesterday by the way. First day of summer if you ask me. The sun was shining in a way that almost, if you really concentrated, felt warming. The sky was the clean blue of a faded parking ticket left on a dashboard for months. The girls of the city, who according to legend are “so pretty” exchanged their rabbit fur coats for rugby jerseys or whatever it is that girls in Dublin think is cool this season. It was sweet. And damn I felt good when I got an ambrosial parking space and headed off to Stephen’s Green to have dinner with friends. I was thrilled to see a post-box where I could dispense of the mix CD and birthday card I had to have delivered to a friend by Tuesday. It was only 20 or 30 feet after the post box that I realised I had posted the tickets to the Jenny Lewis concert I was meant to be going to and still had the birthday card envelope in my hand. See, I had been looking forward to seeing Jenny Lewis for a while. My wife has abandoned me for the weekend and the best thing you can possibly do when you are wifeless is sit in a room adoring a woman you quite fancy. I read that in a Christian book once so it has to be true. All the an Post staff had gone home so they couldn’t help. After ringing the people at The Village to ask them what they could do if someone say, hypothetically, posted their tickets an hour before the gig I realised that hope was running short. I considered using a crude magnetic recovery device that Babbette invented on a boring day back in Franceland but we realised that it is probably illegal to use tools created in France without paying a government department in Paris €600. It’s not all a loss though. I did get the card posted in the end. All this meant that I spent the evening in the company of fellow bloggers and French afficiandos, Stigmund and Babette. It all turned out to be for gain as we sat slumped around a table daring each other to punch annoying girls on the street and egging Stigmund on as he hoovered up all the little sachets of sugar the coffeeshop provided. It turns out that Babette is a freaking genius. I think Stig is her muse. She lives a fanciful life surrounded by expensive staplers and €2000 desks. She may or may not be an expert of French economic policy but she can talk about it as if it isn’t actually tediously boring. She was also very polite as Stig and I basically spent the night recounting stories of our Leixlip childhoods at each other and moaning about how most all of our Christian peers are idiots living in a big commune called “The Righteous Are Self Righteous” without realising how self righteous we were being. She sent us texts at the end of the night outlining our flaws though. So she is generous with her time as well. There is a special disappointment associated with going to see a critically acclaimed movie that turns out to be a pile of crap. It has happened to me a couple of times this year and I think it is because I am becoming an angry old man. If you dare take a step that annoys my sensibilities I will cut you down like a pretty flower marring my beloved barren garden. This happened spectacularly last week when I went to see Junebug. “It got 80% on Metacritic!”, I said, “how can we go wrong?” “Oh alright. Let’s do it!” said Neuro. That is how the exchange went the morning we headed out to see it. Well, there weren’t as many exclamation marks. But I have to set the scene. This movie annoyed me deeply from the opening scene. Argh. Maybe I am a maniac but to me, there is nothing more boring than a movie about how the urban sophisticates shake up the down home country ways of their relatives. I presume at the end that the urbanites discovered they could learn something from their hillbilly Jesus loving, cigarette smoking siblings-in-law. I say presume because I left in an untypical fit of movement considering how bored I was. I walked outside and sat on the kerb of Parnell St reciting poems I learnt in primary school and enjoyed myself more. Although one actress (Amy Adams) really does excel herself, my major beef with this waste of photographic film is the director. He obviously came from the school where you learn that directors are under-rated and so have to make it very obvious in every movie they make that there was a director. The only way he could have been heavier handed is if he appeared in a caption in the corner every now and again explaining “What I’m doing here….”. Although I only have RTE 1, 2, TG4 and that other terrestrial station that has weather, League of Ireland soccer and celebrity news, I have heard rumours about a so called Gospel of Judas. I was frightened to investigate this because I have never before come across a media flurry about an astonishing discovery that will redefine historic Christianity in the week before Easter. Why, that is utterly unheard of! The finding of the new Gospel, though obviously remarkable as a bit of textual history, no more challenges the basis of the Church’s faith than the discovery of a document from the nineteenth century written in Ohio and defending King George would be a challenge to the basis of American democracy. The actual manuscript itself is as far removed from the events of the first Easter as we are from the Declaration of Independence in the USA but that doesn’t stop a whole lot of guff being written about secret histories. About this time last year I lost my energy for dealing with the lie that the New Testament, which let’s remember, tells the story of God dying alone and shamed on a Roman torture device, somehow is a large conspiracy to protect powerful institutional interests. The fact is that the self identity of the Christian churches had emerged fully long before the newly discovered Gospel of Judas (which had, confusingly, been known about for 1800 years) was first written. In fact, Church fathers across the whole Meditteranean had agreed upon the 4 Gospels which now make up the basis for our faith over a generation before the Gnostics wrote Judas. It isn’t a companion to the Gospels of Matthew, Mark, Luke and John. It is a direct competitor which replaces the physical bodily Jesus and his call to social equality, liberation and healing flowing from reconciliation with a God who is alive with a cult of increasingly ascetic secret knowledges led by a ghost-like leader from a different realm. The road from Easter is mapped for Christians by the bloodied footprints of a leader who went to hell and back. It is not just understandable, but almost inevitable, that a movement would rise up from the belly of his followers who sought to do away with the unpleasantness of Jesus’ mission. The authors of Judas’ Gospel were doing the reasonable thing of taking the “core message” of Jesus and removing the slightly icky bits about him being a human who went through puberty and had to go to the loo everyday. All the more reasonable to reform the altogether repuslive parts about the regeneration of everything through the reconcilation of God and man, the revolutionary calling to the utter repudiation of all that is evil that is, wait for it, acheived through an evil and brutal murder! At every step in the road a Christian follows there are siren voices telling us that it needn’t actually be quite so hard. The Gnostics answered those voices and thought it through. Early Christians had a lot of time for thinking languishing in prison or enjoying the quiet isolation of a spell of exile. Instead of taking up this literally suicidal cause of Jesus to redeem every inch of creation and defeat the corrupt power-structures of this world with sacrifice and charity, let’s find a secret place of solace deep inside each of us. Instead of reaching out, let us reach in, they thought. Instead of ushering in a so called “Kingdom of God” through revolutionary communities, let us instead create a Kingdom of self. After all, the god who made this wicked world can’t after all be a good god, and the god who called the Jewish people and then dwells with them in bodily form, can’t be the ultimate high god. Surely there is a higher plane appropriate for our higher thought and let us escape there. Let us create our own patterns of spirituality, each to their own, without reference to this troubling Jesus-movement that puts us in conflict with our lusts, our ambitions, our culture and our leaders. Let’s have the Jesus we would have had if this so called god was clever enough to choose us instead of the Nazarene to represent him. It’s like finding a document purporting to be about Napoleon and his senior advisors, and discovering that they’re talking about nuclear submarines and B52 bombers. It is that crass. But I believe it is a thorough lie. Jesus didn’t come to save the souls of a few and whisk them off to some cloud-bound utopia. Why would the Living God apprentice as a carpenter and then die on a cross to whisk some Middle Eastern guys, then lots of Europeans, then tonnes of Americans and in our day, millions of Africans and Asians off to some other world? Jesus didn’t think that way. Jesus came to make the whole world new and the problem with the Da Vinci Code lie, the Kabballah lie, the Judas lie, is that it doesn’t just fail to take up the Cross of Jesus. It repudiates it. It rejects the calling to give sight to the blind, to set the captives free, to carry the burden of the poor and to exist for the benefit of those who hate. It rejects the calling to do this in the name of a God who made us in His image and not the other way around. It is a lie I sadly can’t hope to overcome. Vintage 21 is a church founded by a former employee of the charity I work for (the American arm that is). They seem to be an interesting bunch of guys. Their slogan is “A community of God seekers, God followers and God doubters”, which I think rocks. But click on the media section of their site and go to the 2nd page. There are 4 segments from the Jesus video that they have hilariously dubbed over. The whole point is to depict Jesus as traditional, judgemental, Bible bashing, good-livin’, church-going Christians seem to believe in if judged based on their lifestyles and behaviour. I love them. I think you will too. Although I have lots of ideas for posts now that my commentators have thrown all sorts of spanners in my work, I thought I would have one go at summing up what I have been trying to say. To ask for empirical proof for God is like asking what shape is yellow. It is a non-sensical question that misses the point. Your Correspondent, Looking like a born-again, living like a heretic. You are currently browsing the zoomtarded blog archives for April, 2006.